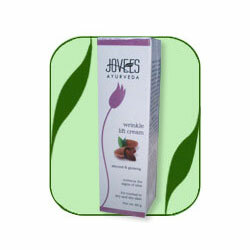 Jovees Advanced Wrinkle Lift Cream contains Almond, Ginseng, Honey, Vitamin F along with other powerful herbal extracts that will help to accelerate the cell renewal process, minimize appearance of fine lines & wrinkles and improves skin tone. It helps to improve the skin's elasticity to give it a supple, clear and younger looking skin. Wash face preferably with Jovees Strawberry Face Wash & pat dry. Apply Jovees Wrinkle Lift Cream in the morning and evening all over face and neck using light circular strokes with finger tips. Leave on. Almond Oil, Ginseng Ext, Olive Oil, Sunflower Oil, Coconut Oil.